Retail giant Walmart enlisted the help of a private military contractor and the FBI to spy on workers pushing for a $15 hourly wage and organizing Black Friday protests in 2012 and 2013, newly released documents (pdf) reveal. A document made public Tuesday by worker organization OUR Walmart reveals company testimony to the National Labor Relations Board (NLRB) in January stating that Walmart had enlisted the help of arms manufacturer Lockheed Martin and the FBI Joint Terrorism Task Force to monitor workers who were organizing for higher wages and the right to unionize. 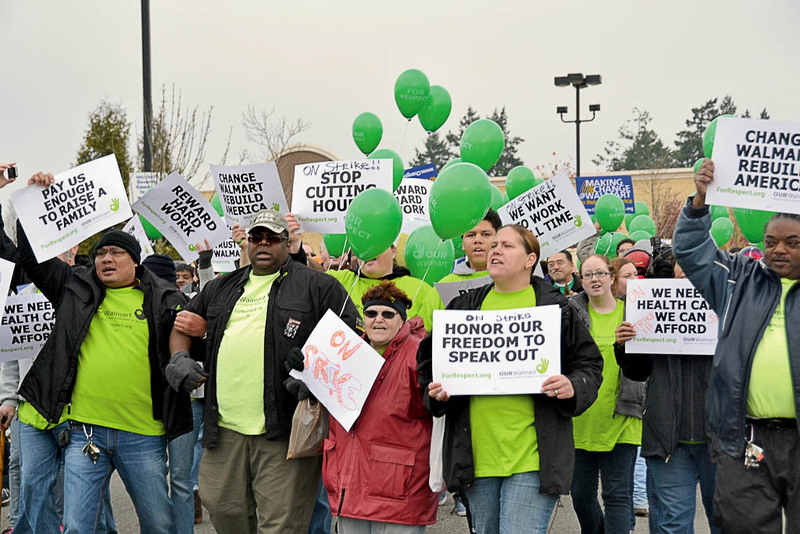 OUR Walmart workers said they were illegally fired and disciplined for taking part in the “Ride for Respect” strike during Walmart’s shareholder meeting in June of 2013. During that time, about 100 workers were actively involved in recruiting for OUR Walmart, but employees (or associates, as they’re called at Walmart) across the company were watched; the briefest conversations were reported to the “home office,” as Walmart calls its headquarters in Bentonville, Ark. [….] Walmart’s aim isn’t only to watch 100 or so active members of OUR Walmart, says Kate Bronfenbrenner, a lecturer at Cornell’s School of Industrial and Labor Relations. “They are looking for the thousands who are supportive so they can intimidate them.” Walmart declined to comment on her statement. The FBI came on the scene next, after the company heard about plans for the Ride for Respect demonstration, which brought a caravan of striking workers to Bentonville for the shareholder meeting, during which 14,000 Walmart managers, investors, and hand-picked associates joined the founding Walton family for a week of events, including an Elton John performance. “With some assistance from LM [Lockheed Martin] we have created the attached map to track the caravan movements and approximate participants,” Kris Russell, a risk program senior manager, wrote to colleagues on May 30. OUR Walmart brought the case after Walmart allegedly retaliated against Ride for Respect strikers by disciplining 70 participants and firing almost 20 of them. Walmart said it was simply enforcing its attendance policy.